This article represents what is known about Volvo 1800's and the Saint but if any reader has further information or locations of other cars used, the author would be very pleased to receive details. Thanks go to Peter Nelson, Kevin Price and Mike Stanton for assisting with information for this article, while reference was also made to Burl Barer's Saint history. It was during the spring of 1965 that I bought my first Volvo P 1800. It was 3½ inches long and cost 4s 6d (serious money in those days for a school boy). This car was the very latest release from Corgi Toys and, like thousands of others, I was hooked! It wasn't just that the lines of this car were among the most exciting ever to be seen on our roads; nor was it its bright white paintwork - something that's been essential on all the real cars I later owned. No, what made this car really special was the fact that this was the car Simon Templar drove, and Corgi toys were very cleverly (and for the first time) exploiting the connection between a motor car and a star of the TV screen, for "The Saint" was among the top rated British television shows throughout the 1960's - and Volvo 1800 cars were as much a part of the performance as Roger Moore who played the leading character. The Volvo P1800 entered full scale production during May 1961. This followed the model's unveiling to the public at the Brussels show in January 1960, where an Italian-built prototype was displayed. Like other prototype and pre-production cars, its radiator grille incorporated a 'V' motif which was not perpetuated on production models, although this was included in the Corgi casting (as were cow- horn bumpers, front and rear) suggesting the model was planned at an early stage. Indeed, an earlier P1800 model had already appeared as part of Corgi's standard range of model cars, one of which was featured in the 15th episode of the TV series, and it was possibly this that caused Corgi to embark on the idea of a Saint version of the model car. The second "Saint" car, 77 GYL, was part of the 'Cars of the Stars' Motor Museum display at Keswick until it closed in 2011. It is now believed to be owned by an enthusiast in the USA. Finished in bright white, it carries a Saint logo on the bonnet - just like the Corgi models did - although such a device was never actually carried in the TV series. When released for general sale to the public, the real P1800 was a truly international car. Whilst based solidly on Swedish design, the striking body lines were derived from Italian thinking and made this model unlike any other Volvo. Engine and gearbox were of course pure Volvo while the rear axle was American and many other components were of UK or European origin. Its monocoque body shell was produced in Scotland by Pressed Steel and because of insufficient capacity in Volvo's Swedish plants, the model was initially assembled by Jensen in West Bromwich. And with its 1780cc engine capable of producing 100 bhp, there was no shortage of power from this stunning newcomer. 1961 was also the year in which a new British television series was being planned. This was to be based on Leslie Charteris' character Simon Templar, alias "The Saint" - which was also to be the series title. For many, this series was to be their first introduction to the character, but in fact Simon Templar first appeared in a Charteris novel in 1928. This was followed by dozens more books, comics, radio stories and films so that by the time the TV series was planned Simon Templar was already one of the longest running characters in detective fiction. 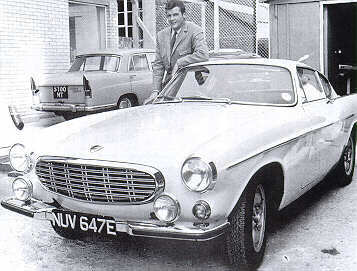 Simon Templar was essentially a British 'hero', although his adventures took him around the globe and he had naturally 'driven' a great deal during his first three decades, his own cars including the fictional Furillac and Hirondel in the Charteris novels. For the television stories, the Saint's car was to be a regular and significant feature and the production team was looking for an exciting sports model which reflected both the performance and style of the main character. What happened next is now legendary. Another new sports car which had recently been introduced was Jaguar's spectacular E-type. The programme makers decided this was the model they wanted for the Saint who, following their failure to sign Patrick McGoohan, was now to be played by Roger Moore. An approach was made to Jaguar to supply a white E-type for the series but the company declined, believing that the' did not need additional publicity an could sell as many E-types as they could produce anyway. Faced with this decision, an alternative sports car o distinctive design was sought and Volvo' was hurriedly approached to provide; white P1800. A London Volvo agent obliged by providing a gleaming, bright white P1800 (registered 71 DXC). All parties were oblivious to the fact the Volvo was about to receive more publicity for its 1800 Series than it could ever have achieved by any other means and the TV company reputedly paid the full list price for the first 1800 car. As many readers will remember, or screen the Saint's car carried registration ST1; but this was added purely for] filming, the plates often crudely hooked over the official number plate while shooting took place. Filming commenced in 1962 and the TV series was an immediate success being screened around the world From the very first episode- entitled "The Talented Husband" the car made regular and often lengthy appearances. Twenty--six episodes were initially commissioned which frequently featured the bright white Jensen-built model. A mock-up of the inside of the car was also created for interior shots which was almost perfect - apart from the omission of interior lights on the rear pillars. In one episode, this interior (together with Volvo engine sounds!) was used to act as the inside of an Aston Martin DB5 - which carried registration BMT 216A, which many will recognise as the number carried on an Aston in the 1964 James Bond film, 'Goldfinger'. As the series progressed, the Saint was to be seen regularly driving his Volvo in France and Germany, and in one episode in the Bahamas - which took some explaining since the story involved the Saint flying in and out of that location! In reality, the car didn't leave British shores but clever editing linked scenes of real locations to studio shots at Elstree. Some driving sequences were taken 'on location', often with a "stand-in" at the wheel and a clever trick used more than once was to print a traffic scene in reverse on screen to create the illusion of the car driving on the right-hand side of the road! One of the most exciting sequences was filmed for an episode called 'The Rough Diamonds' where a spectacular car chase takes place in Central London with Simon Templar pursued by villains in a Ford Zephyr 4 (the villains' car was inevitably a Ford Zephyr for British stories or a white Citroen if the plot was set in France). The drama of the chase was filmed on London streets among real London traffic - and would be difficult if not impossible to undertake today without closing the roads to the public at large. During 1963, assembly of Volvo Pl800s was transferred from the UK to Sweden and a few minor changes to the detail of the car occurred with this move, while an 'S' suffix was added to the model designation. Not surprisingly, the huge impact made on the popularity of this model by its appearance in the series was now obvious to everyone and, late in 1963 a new Swedish-built P1800S was supplied to add to the previous car. This car was registered 77 GYL and, significantly, in addition to its film role was also to be Roger Moore's own personal car for the next few years. However, among the changes caused by the transfer of production to Sweden was an alteration to the range of colours in which the cars were finished, and instead of bright white the nearest available alternative from the range of standard colours for Swedish-built Volvo cars was Pearl white - which was much 'creamier' than the previous shade. In view of the image created by the Saint's white Volvo, this seems an extraordinary situation for although the TV series continued to be filmed in black and white - so it was virtually impossible to tell the difference on screen - a customer wishing to purchase a white Saint-car look-a-like had, from now on, to be content with a rather disappointing 'cream' compared with that originally portrayed on TV. Another variation with the Swedish-built cars was that they featured Volvo's standard chrome hub caps with red 'V' emblems in the centre. It was decided however to fit Jensen-style discs on the new Saint car (which production. 'Swedish' models never had) to maintain continuity of appearance, but in episode fifty-five entitled 'The Contract', three scenes occur, intermingled with others, showing the car before the wheel trims were switched. Frequently, episodes featured scenes with both the 'Jensen' car and later 'S' models interspersed but the only occasion when two 1800s appeared side-by-side on screen was in 'The Miracle Tea Party' where a scene at Waterloo Station shows the Saint's car passing a dark-coloured 1800. Whether this was coincidence, or was perhaps Leslie Charteris' own car (as it is believed he too drove an 1800 for a while) is unknown. As production of these cars continued in Sweden, now known as the "1800S", several further detail changes took place - as is regularly the case with car production. The point was therefore reached where the TV series was in danger of portraying an out-of-date car as modified bumpers, grille and yet another type of wheel and hub cap had been introduced. It was therefore decided to provide Simon Templar with an up-to--date 1800S with modifications consistent with those introduced from 1965. To achieve this the programme producers imaginatively devised a situation in 'The Frightened Inn-Keeper' (story no.61), in which the Saint's car was blown-up (needless to say - without the hero inside). This incident conveniently took place behind a hedge so no actual damage to a car was necessary! This story began with a bright white 'Jensen' model in the opening sequences, which could have been 71 DXC, the original car, as all the details such as aerial and GB plate matched, except bullet-style wing mirrors were fitted. After the explosion, the story-line involved the Saint taking delivery of a replacement car, and a shiny 1800S with the latest features arrived on screen. This could well have been yet another car but it has been suggested that in fact it remained 77 GYL, as its bumpers, wheels etc were modified to the latest style for continued film work. In this updated form the car continued to be prominent, but continuity errors continued during following episodes, with scenes mixed with older car(s) from time to time, including two episodes later in 'The Smart Detective' in which the London car chase scenes were re-used! Roger Moore next to one of the 1967 cars, NUV647E, which featured sports wheels and were used until the end of the series. Polygram/Pictorial Press. By the end of 1965, seventy-one episodes had been made and "The Saint" was to switch from black & white to colour. Although still a few years away, this was in readiness for the coming of British colour TV and also catered for certain overseas markets, but the next series could initially still only be broadcast in the UK as a black and white transmission. It was to be several years before British viewers could enjoy re-runs of "The Saint" - and later still home video versions - in full colour. From this point the cream, rather than bright white car colour became obvious in many scenes - although some shots appeared to continue to suggest the car paintwork was bright white. It is possible an original Jensen car remained with modified grille and bumpers, or a car had been repainted. A third possibility is that photographically a brighter shade is conveyed, especially in night scenes, as this is certainly often the case even today with still colour photography of these cars. The interior of all Saint Volvos used up to this point was red, including the interior mock-up which remained in regular use, even though clearly based on a 'Jensen' design with its distinctive parcel shelf arrangement. After 14 colour episodes, the 1800S appeared on screen with a further modification as eight-spoke sports wheels were now to be seen, but Volvo was by this time making still further improvements to its 1800 range including replacement of the curved side chrome trim with a straight design, while power had now reached 115 bhp. Existing versions could not easily be updated and, in any case, the TV cars were growing older in other respects too. As a consequence, further changes to the TV Saint's transport occurred during 1967. Early that year two new cars were delivered to completely replace the earlier models. Registered NUV 647/8E, they were again finished in the cream 'Pearl white' shade rather than bright white (the latter remaining unavailable yet Volvo publicity continued to illustrate cars in bright white! ); and spoked wheels similar to those introduced on the previous car were also fitted. Internally, one was upholstered in red and was for Roger Moore's private use, while the other, with black interior, was primarily for film work. These cars remained until the Roger Moore Saint programmes ceased to be made in 1969, receiving reflective 'ST 1' number plates for the final episodes. Forty-three colour versions of "The Saint" were made together with two feature-length stories, making 116 programmes in total when added to the earlier black and white productions, the majority including the Volvo cars. With the exception of the Bahamas story mentioned earlier, whenever the Saint appeared in an overseas location where he would have been unlikely to have taken his car, a different type of local car became his means of transport - although it was invariably white. Just once, in an English story entitled "The Checkered Flag", did the Saint appear - without any explanation - driving a Bentley Continental. "The Saint" was produced during a period when British television was itself rapidly developing, and private car ownership was booming. The series promoted Volvo 1800s in a way that is difficult to parallel and which could never have been achieved by any other method, yet all this occurred largely by accident! As a result, this model will always be associated with the Roger Moore Saint series. During the late 1970's, the programme concept was revived as 'Return of the Saint' starring Ian Ogilvy. Again a white car carrying registration ST1 was used but this time it was a Jaguar XJS - Jaguar choosing not to miss the opportunity to feature one of its cars in this series (!) - and there was even a Corgi version of this car. But the new series did not enjoy the success of the earlier versions. Later still, Simon Dutton took on the role of Templar for a short run of feature length stories filmed in the 1980s, and reverted to the darker side of Leslie Charteris' character. His car became a dark blue Jensen Interceptor with registration reversed as '1 ST'. This registration now adorns a Rolls Royce in the West Country while the previous ST1 is currently carried by a Mini in London. Of the original Volvo cars used for film work, there is no record of 71 DXC or NUV 647E. However sister car NUV 648E, which was sold for almost £50,000 after the series, now resides at the Cars of the Stars Motor Museum at Keswick, as does 77 GYL which now forms part of the principal display carrying "Corgi Toys" livery - having been resprayed bright white with a Saint logo painted on the bonnet.